Beautiful but dangerous: Black Widow Spiders, Latrodectus spp. Red or orange spots on the underside of a bulbous abdomen are the hallmark of black widow spiders. Several weeks ago a family friend discovered a gorgeous black widow spider in a shipment of goods. Always nice to find an unexpected surprise in a box but fortunately for the Bug Guy and the spider, our friend did not freak out but instead captured said spider and donated it to Bug of the Week. Another name for these creepily beautiful arachnids is ‘hourglass spiders’ due to the bright red hourglass-shaped mark on the underside of the abdomen. Having paralyzed a hapless moth with venom and wrapped her victim in silk, the black widow will feed at leisure. The black widow is arguably one of the most interesting characters in Marvel Comics pantheon of heroes and also one of the most dangerous groups of spiders in the United States. The widow’s venom contains a very potent neurotoxin, alpha-Latrotoxin. A measure of the toxicity of alpha-Latrotoxin, an LD50 of 20 – 40 micrograms per kilogram of body weight, puts it right up with some very deadly snakes. Fortunately, widows do not always inject venom when they bite and even if they do, the quantity is exceedingly tiny. There are five species of widows in the United States and they are found in every state except Alaska, but mostly in southern and western states. Widows spin loose webs in protected places such as under logs, stones, or boards, and in angles of windows and shutters. They are commonly found in dumps and in rural areas such as farms and plant nurseries where they frequent barns, sheds, outhouses, and equipment storage areas. Like most spiders, the fangs of the black widow are used to capture prey and the venom injected through the fangs helps subdue the victim. Also like most spiders, black widows are not aggressive and bite humans only when harassed or accidentally pinched or grabbed. The bite of the widow is usually painless or felt as a pin-prick. The more serious symptoms of the bite first appear within 30 minutes to two hours after the bite. These include back pain and muscle cramps that can be severe, rigid muscles in the abdomen, nausea, vomiting, sweating, restlessness and, in some cases, elevated blood pressure. These symptoms are most severe after 3 hours but may persist for many days. Our gorgeous black widow Scarlett glides back to protect her unhatched brood in the egg case after carefully inspecting her gossamer web. Black widows do not discriminate among their human victims and envenomation can occur in people of any age. In the U.S. about 2500 bites are reported each year with the greatest number of bites in children. Lethal bites are exceedingly rare and only three deaths have been reported worldwide in the medical literature. Complications associated with black widow bites are greatest for the very young, the very old, and persons with cardiovascular disease. The death rate from documented bites occurs in far less than 1% of reported cases. Rapid treatment with an antivenin and other medication can greatly reduce the severity and duration of symptoms associated with a black widow bite. Unlike other spider bites, such as those from the brown recluse, there is no terrifying necrotic skin lesion at the site of the bite. Hundreds of spiderlings hatch from a single egg sac of the black widow and each female can lay several egg sacs annually. To avoid bites of black widows and other spiders wear gloves and long sleeved shirts when you work in areas that might house spiders. Try to reduce clutter such as brush piles, vegetation, trash, and rubbish where spiders might hide outdoors. Do the same for furniture, sports equipment, and clothes indoors. Carefully inspect these items before moving them and store them in containers or sealed bags whenever possible. If you are bitten by a spider, try to collect the spider whether alive and intact or dead and pulverized. This will help a trained arachnologist identify the offending arthropod and help direct the course of therapy. If you or your child is bitten by a black widow spider, seek medical attention immediately. Finally, despite its name, the black widow does not always eat her mate. 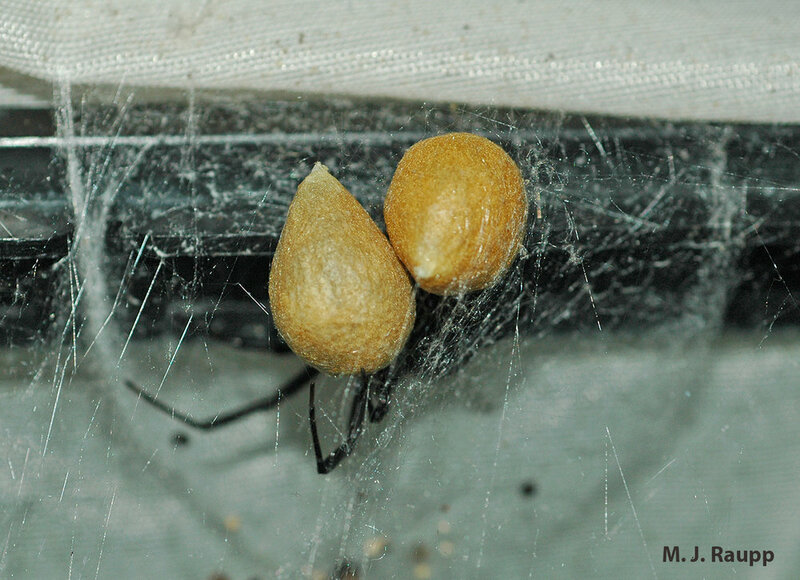 In fact, in some species of widows the male actually brings food to his mate. What a guy! Special thanks to Karina and her friend for sharing their gorgeous spider with us. The great spider book ‘Biology of Spiders’ by Rainer Foelix, and the fact filled article “The Treatment of Black Widow Spider Envenomation with Antivenin Latrodectus mactans: A Case Series” by Steven R. Offerman, G. Patrick Daubert, and Richard F. Clark served as references for this episode.